This set of chairs consists of two armchairs and six single chairs which form a good set of eight dining chairs. The chairs consist of a shaped top rail with central recessed panel with carved reeded decoration, to either side a superbly carved fleur de lys design with gadrooned decoration. This leads down to the central back rail, being superbly carved with circular carved floral decoration with carved scrolling foliage to either side, leading on to scrolling carved design to the edge. 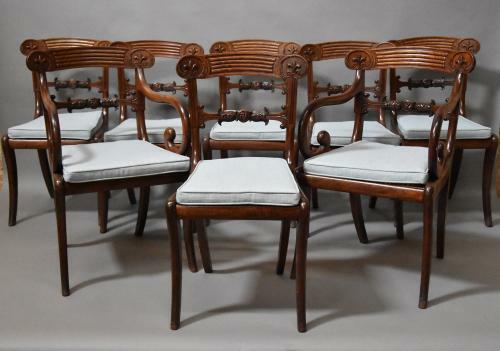 The armchairs have scrolled arms, the chairs have original cane seats all in very good condition with recent pale blue piped cushions (these can easily be replaced by the purchaser if necessary to suit personal taste). The seats lead down to a rounded front rail supported by elegant sabre legs both to the front and back. This set of chairs are all in excellent original condition, are of stable construction and can go straight into a home.